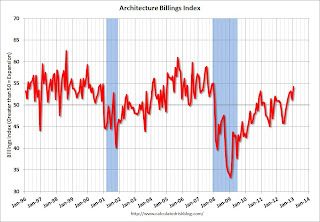 Calculated Risk: AIA: "Strong Surge for Architecture Billings Index"
AIA: "Strong Surge for Architecture Billings Index"
As the prognosis for the design and construction industry continues to improve, the Architecture Billings Index (ABI) is reflecting its strongest growth since November 2007. As a leading economic indicator of construction activity, the ABI reflects the approximate nine to twelve month lag time between architecture billings and construction spending. The American Institute of Architects (AIA) reported the January ABI score was 54.2, up sharply from a mark of 51.2* in December. This score reflects a strong increase in demand for design services (any score above 50 indicates an increase in billings). The new projects inquiry index was 63.2, much higher than the reading of 57.9 the previous month. 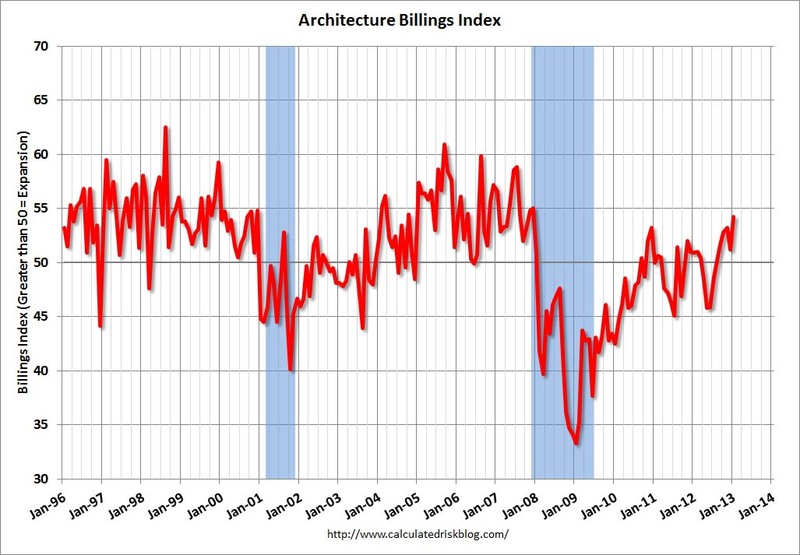 This graph shows the Architecture Billings Index since 1996. The index was at 54.2 in January, up from 51.2 in December. Anything above 50 indicates expansion in demand for architects' services. Every building sector is now expanding and new project inquiries are strongly positive. Note: This includes commercial and industrial facilities like hotels and office buildings, multi-family residential, as well as schools, hospitals and other institutions. According to the AIA, there is an "approximate nine to twelve month lag time between architecture billings and construction spending" on non-residential construction. This suggests some increase in CRE investment in 2013.